This event is almost fully booked but a limited number of tickets are still available. Book now to avoid disappointment. For our Christmas event we have the facilities at Science Oxford for the evening. They include a robotics obstacle course, a Micro:bit challenge, a Christmas decoration needing a bit of coding and some tricky puzzles. There will be three members of staff on hand to help novice or rusty coders. And, of course, Christmas fare and prizes! This event is suitable for anyone aged 10 or over. Please bring along the kids, it would be a great experience for the whole family. Any one taking part in coding a micro:bit will be given a raffle ticket and at the end of the evening there will be a draw. The winner gets a micro:bit. Christmas Decoration – make a felt pouch to hang on your Christmas tree, with a micro:bit inside with your light up Christmas message, try scrolling it. (you cannot keep the micro:bit but you could win one). A BBC micro:bit is a small microcontroller – it has a pixilated ‘screen’ on the front made of 25 LEDs. Two buttons you can use to control it and loads of other interesting features. It needs a bit of coding to bring it to life. In an ambitious program, up to one million BBC micro:bits have been delivered free to 11 years olds in schools in England, Scotland and Wales. Even if you have never done any coding you will find it fascinating just to stand and watch how it is done and what can result. You might even find you can do it! 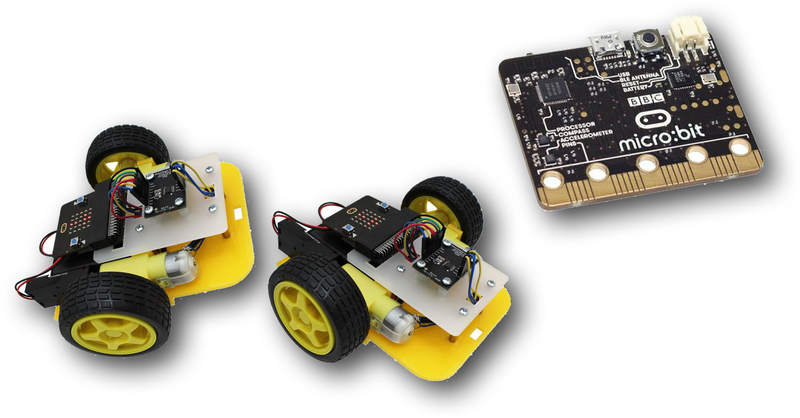 The tiny little micro:bit will be offered with two ways of programming it on the night. The simpler version just involves dragging little blocks around on the screen. If you can build Lego models you can do this and produce results in minutes! Budding racing drivers can pit their wits against each other on an exciting obstacle challenge with a remote control robotics car powered by a pre-programmed micro:bit. The winner gets a robot car kit to take home. Impossible Puzzles – – A collection of mind blowing puzzles dotted around. There are 2,339 different ways to make one puzzle into a rectangle. As numbers are strictly limited booking is necessary and we will need to sign you in at the main reception.